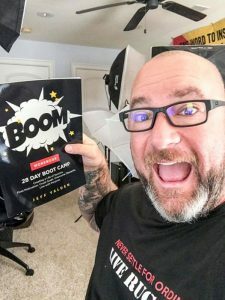 Youth motivational speaker and author Jeff Yalden is stoked about the principles in his brand-new workbook, The BOOM 28 Day Boot Camp: Creating a Life of Success. Find Motivation. Crush Goals. Overcome Obstacles. Live with Purpose. If put the daily principles to work, your life will change – and he has been laying out each step right here. But Jeff can’t do the work for you. Only you can do that. The impactful information found in The Boot Camp workbook is based on Jeff’s Amazon bestseller, BOOM! One Word to Inspire Action, Deliver Rewards, and Positively Affect Your Life Every Day. Use these together and you have an actionable framework for taking ownership of your life. If you are follow Jeff, you might notice you have heard those words before – and you are probably going to hear them again. “Sometimes we get to a point where everything is going well: We are working really hard, contacting people and rewriting our plan – and then we get a little bit complacent or an interruption comes and we have to put our energies on something else,” he said.You might realize that you have missed a day in the Boot Camp. A perfect example of grinding through it comes directly from Jeff’s life. He recorded this episode two days after experiencing an incident that he says really affected his spirits and set him back a bit. The following day, he had to be at his best. No matter what you are dealing with and no matter what you are going through, it’s going to be OK.
Value yourself. Your attitude and choices are most important. Remember the BOOM. Bring the BOOM back into your life when you are grinding through it. Don’t shut down. Don’t not do it. BOOM! Get up. Do it! BOOM is also an effect. No matter what you are doing, Grind Through It.